Derek spent a lot of time putting up fence like this around the wheat fields. The tape is white to help the cattle (and us) see it, and it does carry an electric current to keep them from just pushing the fence over. Derek and I have both been shocked several times. We are completely fine, but we try not to touch it again. The cows feel the same way. 804 was one of our favorite heifers. 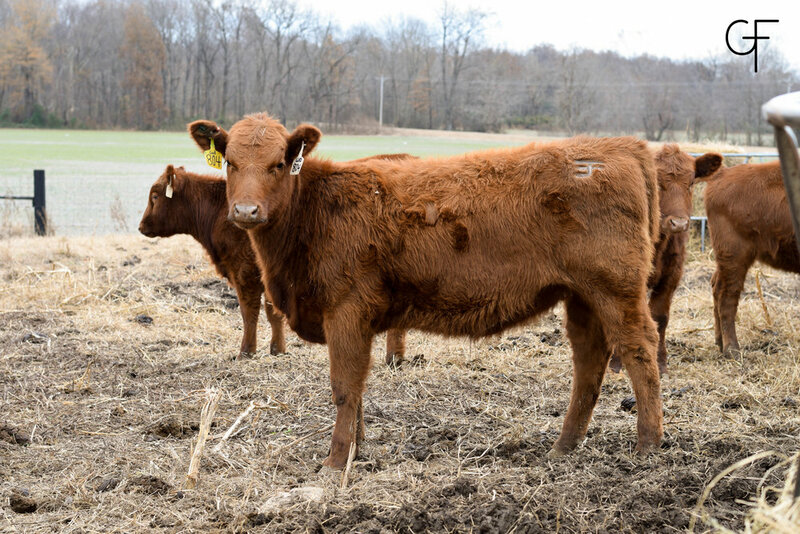 Her long body will give her plenty of room to grow big calves, her straight legs will withstand her weight and allow her to cover many miles grazing, and her gentle personality (characteristic of the Red Angus breed) will make her a pleasure to take care of. This photo was taken three days after she arrived on our farm. 586 and 623 were two of the most gentle calves we bought. Every time I took my camera to the field, they were always the two in front. These heifers were also two of the best growers, so it's no surprise I caught them here at the hay ring. The heifers insisted on wearing their hats for their Christmas photo! Back in the fall, Derek and I began our first major project together! We bought a set of commercial Red Angus heifers, all freshly weaned, all fuzzy to prepare for the cold months to come, all ready to be turned out on our wheat to grow into perfect little replacement heifers*. Every fall, Derek plants many of his fields with wheat. The wheat won't actually be harvested. It's used as a conservation technique. The wheat's roots form a net going down several inches into the soil and this net holds the top soil in place when winter storms threaten to carry it away to the nearest ditch. Normally, this wheat just grows, then dies, then decomposes. It's sole purpose is to keep the soil in place and keep the nutrients in the field where they belong. But we, like several other farmers, saw even greater potential in the tender, green winter grass. A heifer will eat about 3% of her body weight every day and all the food she eats gets broken down in her digestive system and put directly back onto the soil when she... you know. This means wheat that is grazed still does it's job, plus it does a lot of good for the animals that eat it. The wheat growing in the fields could make up a big part of a heifer's diet, and combined with a few handfuls of grain everyday, it could make a nine-month-old fuzzy baby look like an attractive, young lady. So we took a leap of faith and bought eighteen heifers. We knew we would keep three, but we also knew we would have to find permanent homes for the others before Derek needed his fields back in the spring. Cattle actually have very sensitive stomachs. This is because they depend on the bacteria in their gut to breakdown the complex fibers they eat. Each animal has four stomachs because the process is so complex. To help our new heifers prepare for their new protein-rich wheat diet, we slowly introduced them to a protein supplement and gave them a little more every day until they reached the same level of protein intake that they would get in the wheat field. To help them acclimate to their new home, we kept them in a pen near our house where we could check on them several times a day. Our job was pretty simple after that. We checked them at least once a day and made sure their water tank was full of fresh water. When the wheat got short, we switched them to the next field over. After about 90 days, the heifers had grown an average of 3 lbs/day! As you can see, they carry the added weight really well! When our heifers left for their new homes last week they were one year old. In the next few months they will be bred for the first time and about one year from now they will have calves of their own. You see, growing replacement heifers, is a small part in the whole process of raising beef, but Derek and I are happy that we can be a part of it. And just like most producers, Derek and I, are just as committed to being transparent and honest as we are to raising healthy, happy cattle. We are proud of our farm and our cattle, and we hope if you have any questions you'll contact us! *Replacement heifers is a term used to describe young cows that will replace the older cows in a herd. We are keeping three of the heifers we bought for replacements in our own herd.